BEST FRIENDS As the weather turns cold and rainy, Dungeness crab and wild chanterelle mushrooms make their appearance in Sonoma County. In Politics and the English Language, the great George Orwell offers rules for good writing. The one that sticks in my mind is his prohibition on clichés: "Never use a metaphor, simile, or other figure of speech which you are used to seeing in print." That's good advice, but "never" is a strong word. The thing about clichés is, many of them are true. Birds of a feather flock together. Youth is wasted on the young. Happy wife, happy life. All true. While I strive to heed Orwell's advice, I'm going use another cliché here: "Grow together, go together." It not only rhymes, but it's a fact and a cooking guideline I use all the time. The commercial Dungeness crab season generally opens a few weeks before Thanksgiving. This year it began Nov. 15 south of Mendocino County. I've had a few crab feasts already, and the scuttling critters were fat and sweet. Shortly after crab season begins, the rains come, and that means wild mushrooms start popping up. Crab and mushrooms don't exactly grow together, but they do appear about the same time, so I got to wondering how to combine these two cold-weather compadres. 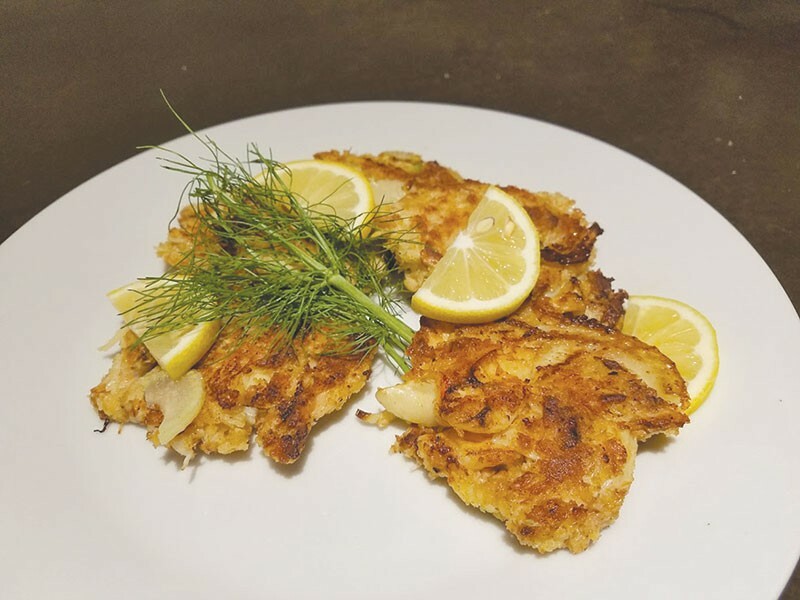 The result: Dungeness crab-chanterelle mushroom cakes. Wild chanterelle mushrooms had not yet appeared locally yet, but recent rains may have changed that. For me, a crab cake should be a barely held together mass of crab. Crab cakes that rely on mounds of breadcrumbs are disqualified. I use as little as possible, but they add a nice golden color. And please make your own. Store-bought breadcrumbs aren't fit for pigeon feed. The fennel adds a vegetal counterpoint to the richness of the crab and mushrooms, and the Padron pepper powder is one of my new favorite ingredients. It sneaks in a little chile pepper warmth. Pimentón, smoked paprika, can also be used. Lightly salt the mushrooms and let stand in bowl for about 15 minutes, and then squeeze to remove moisture. Combine with all the other ingredients except butter and lemon. Form into 10 patties. (You'll probably cook these in two batches.) Heat half the butter in a heavy skillet until bubbles have disappeared. Fry about three minutes or until golden brown. Carefully flip and repeat. Add the rest of the butter and cook remaining cakes as above. The proof is in the pudding of this recipe, no matter what Orwell says. If it grows together, it goes together. Try not to wolf them down.